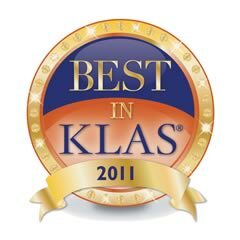 Dimensional Insight—whose DiverDimensional Insight has been named 2011 Best in KLAS Awards: Software and Services winner for Business Intelligence/Reporting. This is the third consecutive year our flagship product, The Diver Solution™, has won this prestigious honour. The Diver business intelligence solution helps hospitals across the US meet their quality, financial, operational and regulatory targets. DI announced today they again received the 2011 Best in KLAS Awards: Software and Services for Business Intelligence/Reporting. Over two decades, Dimensional Insight has worked with hundreds of hospitals across the US to harness data from multiple systems into interactive reports, dashboards, scorecards, and analytical tools. Clinical, quality, operations, and financial departments rely on the resulting timely access to data to drive improvements. The flexibility inherent in Diver’s architecture allows hospitals to implement business intelligence initiatives faster, more flexibly, and more cost effectively than competing solutions. Many hospitals design their dashboards and interactive reports or use Diver’s analytical tool to tackle productivity, quality, revenue cycle, and clinical challenges on their own. Summarizes physician activity across a wide range of performance criteria, including utilization, quality, safety, and patient satisfaction. Monitors information critical to optimizing utilization and efficiency of surgical facilities. Provides front-line managers and executives with up-to-date actionable information on staffing, workload, and productivity metrics. Consolidates information from across the hospital or institution for convenient, timely access and analysis. Enables role-based access to details behind General Ledger dashboard regardless of the source system. KLAS Enterprises, LLC is an independent technology research firm that compiles annual ratings of healthcare IT vendor performance from healthcare executives, managers, and clinicians from over 4,500 hospitals and 2,500 clinics to inform providers’ technology selections.